Rhod will fight whichever foe is closest.Bird-man, goblins, he'll fight any of them. "Perish, spawn of Chaos!" shouts Wiglaff in the elven tongue, swinging his bloodied ax with abandon! He presses the attack, attempting to fight alongside Rhod & Maloof to push the goblins back through the door & then hold the doorway against them. If there is room for Aldbane or Grampus to fight with them, he'll eagerly make a place in the line. Vesh will move forward & attack any Goblin that gets in range of his staff which he has clutched in both of his hands especially if his comrades are being surrounded. He'll hold his sleep spell in case the melee draws the Kolbolds (there should be 6-7 left unless they killed each other)from earlier, as he doesn't want to accidentally catch his comrades in it if he were to cast upon the Goblins - unless things are dire, as he can always wake them up if nothing else comes because of the sounds of melee. Aldbane moves forward and attacks the nearest goblin! Grampus hates goblins! He pushes his way past Vesh, draws his magic sword, and tries to join the melee. The other dwarves are in shield wall formation, protecting the party against attack from the east. After killing the birdman, Rhod turns back to fight the goblins. 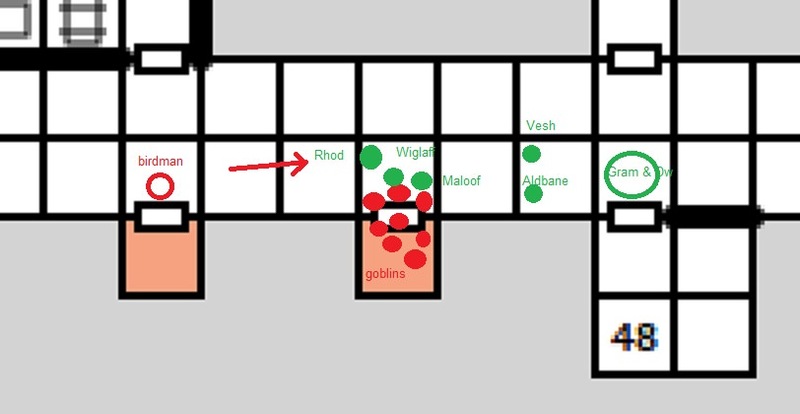 Sadly for Grampus, by the time he gets to the melee there is no place for him, as Rhod, Wiglaff, Maloof and Aldbane have sealed off the area around the door, and are bringing the force of four people to bear on a front of 3 goblins. A mostly indecisive skirmish results in Wiglaff slaying a second goblin, who gets replaced by another eager opponent. The next round is a slaughter, as all four party members land their attacks, collectively butchering the three goblins outside the door. The remaining 3 goblins inside the room slam the door shut! Is the door the bird-man came out of open or closed? If open, Wiglaff will move twenty feet west & peer quickly around the doorframe into the bird-man's room. If closed, he'll move to the door & listen for sounds from the other side.